One boy's harrowing journey through the criminal justice system, and his fight to reform it. Nearly a quarter of a million young people are tried, sentenced, or imprisoned as adults every year across the United States. 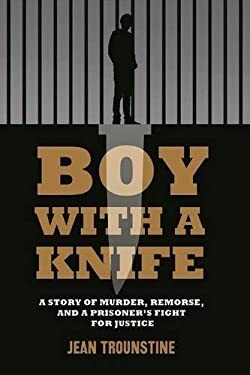 Putting a human face to these sobering statistics, Boy With a Knife tells the story of Karter Kane Reed, who, at the age of 16, was sentenced to life in an adult prison for a murder he committed in 1993. The emotional and devastating narrative takes readers step by step through Karter's crime, trial, punishment and survival in prison, as well as his readjustment. Used Good (3 available) 1632460246 Unused book w/ minor cosmetic damage. Click on read more. >>> This is a bookstore return that has never been read or used, but has small cosmetic damage, like a cover crease or ding, damaged dust jacket or bent pages. It does NOT have writing in pages, and we guarantee access codes and supplements with our used items where applicable.100% Satisfaction Guaranteed. FAST Processing; friendly, tip-top service. : -) Please compare our seller rating to others; we are the fast, smart, hassle-free choice. Customer service is not a department; its our attitude. FYI: Standard shipping is 2-8 business days. YOUR SATISFACTION GUARANTEED! Used Very Good (20 available) 1632460246 Clearing Inventory! Book has minor flaw, like bent or scratched cover. Total Satisfaction Guaranteed. Quick Handling. We work every day but Sunday. Standard delivery takes 4-14 business days. Please note: Shipping may take longer if you live in Hawaii or Alaska, Puerto Rico or Guam. YOUR SATISFACTION GUARANTEED!